When weighing their print management options, savvy professionals can usually pare their concerns down to one two-part question: How much will it cost and how long will it take to implement? Well, we at PrinterLogic have an impressive answer to that: Almost nothing (or less! ), and no time at all. That’s based on new data from the independent research firm TechValidate collected through individual surveys with verified PrinterLogic customers in the manufacturing industry. 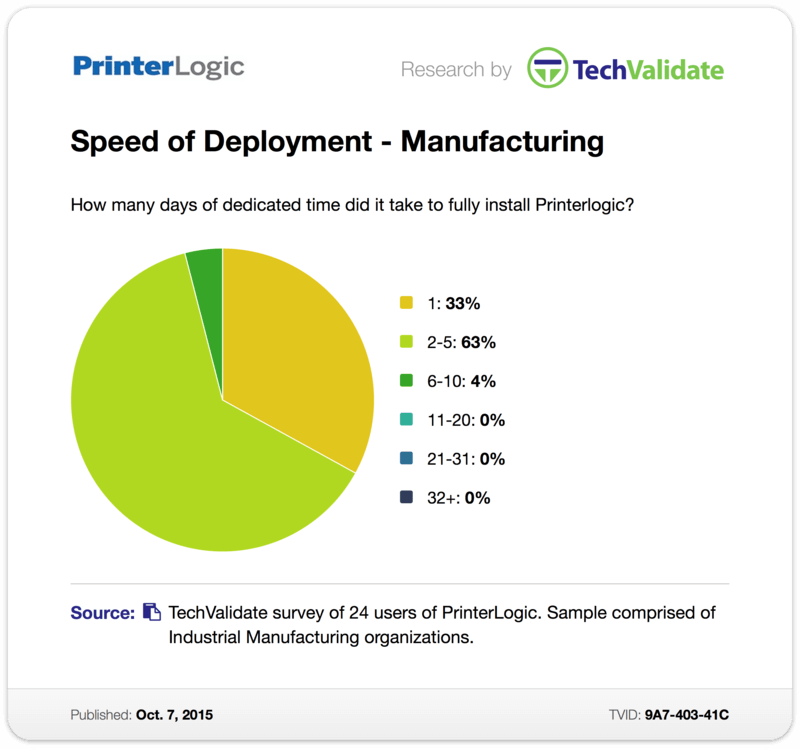 Asked about the speed of deployment (TVID: 9A7-403-41C), an incredible one-third of these manufacturing companies said it took them only one day to fully install PrinterLogic. Think of it—24 hours or less to implement our time- and cost-saving print management solution enterprise-wide! All but 4% of the remaining respondents reported that deploying PrinterLogic had taken them less than five days. What’s more, there wasn’t a single respondent in this survey who said that it had taken longer than ten days to implement PrinterLogic throughout their entire organization. Just to put those statistics in further context: These are large and medium-sized industrial manufacturing companies, many of whom had been reliant on print servers for years—if not decades. They represent a variety of sectors within their industry, including professional services, energy and utilities, education, nonprofits, and real estate. And yet, across the board, we see not only remarkable speeds of deployment with PrinterLogic but consistency among those timeframes as well. With such rapid speeds of deployment, it’s no wonder that companies in this same industry saw downright astounding returns on investment (ROI) after implementing PrinterLogic, as they recently reported in a separate TechValidate survey (TVID: C7F-C97-38E). 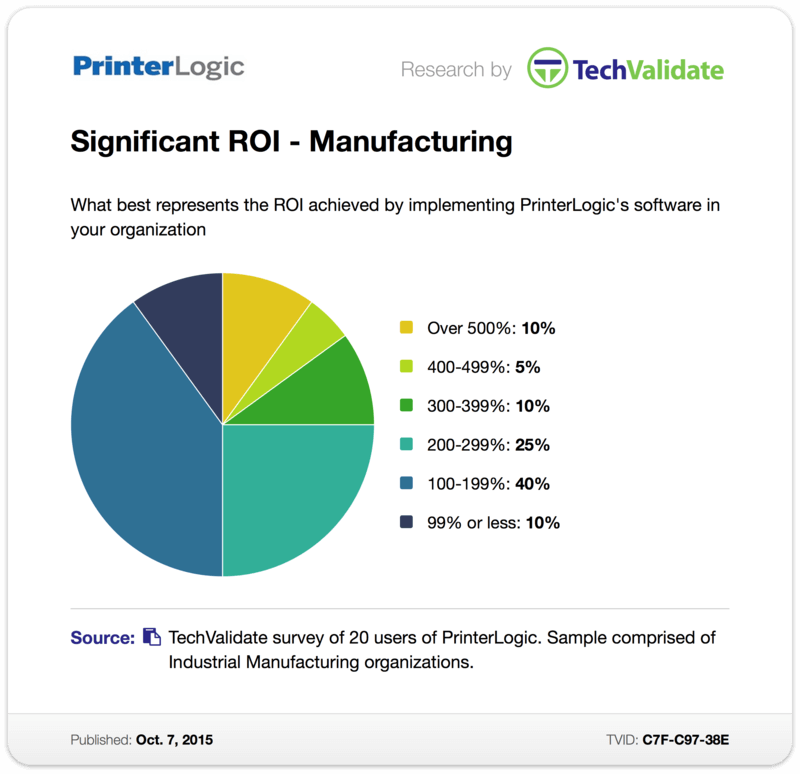 A full 90% of these respondents stated without reservation that their organizations had realized ROI of 100% or more since deploying PrinterLogic. That means PrinterLogic had already fully paid for itself and was continuing to generate additional returns over the long-term. Half of the respondents in this same survey even reported ROI greater than 200%. One-quarter of them saw ROI as high as 300% or more. Better still, one out of every ten reported ROI in excess of 500%. What hard data like this shows is that the companies experiencing these outstanding results with PrinterLogic aren’t outliers. We’re not talking about a single instance where a PrinterLogic customer saw jaw-dropping ROI or enjoyed lightning-fast speed of deployment. With PrinterLogic, it’s clear that results like these tend to be the rule rather than the exception. And that goes for all industries, not just manufacturing. If you’re considering PrinterLogic for your organization, we encourage you to check out our wide-ranging portfolio of case studies, where you’ll find in-depth interviews with and reports on PrinterLogic customers of all sizes and sectors. These case studies are the perfect counterpart to TechValidate surveys like the ones above because they provide firsthand details on how PrinterLogic’s flexible, streamlined approach to print management has benefitted hundreds of diverse organizations all over the world. Why not make yours the next?